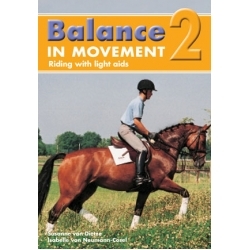 Urban Horse Promotes Balance In Movement 2 - Riding with Light Aids DVD by Susanne von Dietze and Isabelle von Neumann-Cosel. "Susanne von Dietze is a physiotherapist, riding instructor, and upper level dressage rider. Her background in physiotherapy enables her to understand the complex physical relationship essential between horse and rider. Based on the understanding that the rider's seat serves as a 'dynamic balance' in the horse's own movement, here Susanne von Dietze has provided a follow-up to her best-selling DVD - Balance in Movement. In this 43 minute program, she gives in-depth advice for learning and applying effective and correct aids - from basic to more advanced work - and includes a wide range of detailed suggestions for daily training at every level of riding.